Good morning, here is your Sunday Patriots news 03-24 and AFC East Notes. Spring to a backseat to a snowstorm that hit the area on Saturday…A sight no one was happy to see except maybe the ski slopes still operating in the area. We’ll begin our draft profiles on players that we feel would fit the team on Monday. Also, we’re doing a special Patriots 4th and 2 podcast early this week on some of the potential fits for the team in the draft. Be sure to check for that. ICYMI: Our first Mock Draft 1.0 attempt at building the 2019 Patriots roster is in the books. You can recap it here: You can expect the Patriots to be very active in this one, moving around the board due to having 12 draft picks and half of them in the first 101 picks. Bill Belichick was in Hollywood with Linda Holliday and as the pair came out from dinner and were awaiting their car from the valet, the paparazzi descended on Bill in force. While Ms. Holliday was gracious with some of the questions, Bill in a quintessential Belichick performance didn’t say a word to the ridiculous, inane questions thrown at him by the clueless TMZ staff. Listening to those questions, undoubtedly made Bill homesick for a press conference in the Gillette media workroom….ok maybe that is a stretch. So how was your week, Bill? Stephon Gilmore freed up $5.67 million dollars of cap space by converting $8.5 million dollars of his contract into a signing bonus, which was reported by Field Yates of ESPN. 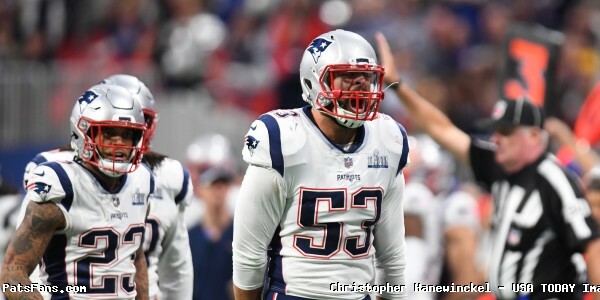 That move gives the Patriots some much-needed space and comes just at the right time as the team is supposedly in negotiations with kicker Stephen Gostkowski on a new contract. Do you think Tom Brady is slow? Maybe on the football field, but watching Brady zip down the ski slopes in the Rockies faster than we can drive any morning on the Mass Pike was a bit disconcerting to watch…can’t imagine the team was thrilled to see that. While we’re all waiting on news of an extension for the Pats QB, he won’t sign anything until he gets back from vacation. Ryan Allen has re-signed with the team and is coming back on a one-year deal. The veteran of six NFL seasons was just 20th in the NFL a year ago with a 45.1-average. However, Allen’s value lies in his directional punting and the ability to pin teams back inside their 20-yard line. In the Super Bowl against the Rams, he did so three times and could have been a candidate for the MVP of the game. Former Patriots WR Malcolm Mitchell had to finally come to the realization that his chronic knee woes won’t let him continue his fledgling NFL career and it was over just as it getting ready to take off. Mitchell had close to 10 surgeries on his knees between college and the NFL. The Patriots knew his injury history when they drafted him in the fourth round of the 2016 NFL Draft. He caught 32 passes for 401 yards and four touchdowns in his rookie and only season in the league. But the vast majority came in the second half of the season. In Super Bowl LI, during the biggest comeback in Super Bowl history, Mitchell caught five passes for 63 in the fourth quarter, helping the Patriots tie and then beat the Atlanta Falcons in overtime. But another knee injury forced him to miss all of the 2017 season. 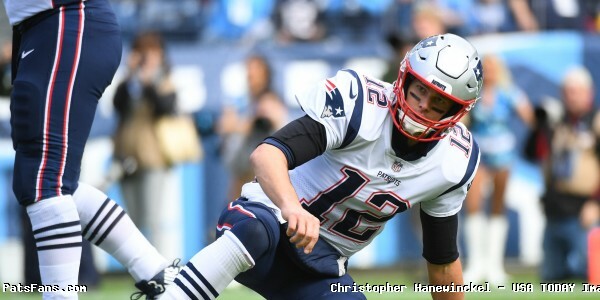 When his knee didn’t respond to treatment, the Patriots released him in 2018. In January, he said he wanted to continue his football career, but sadly it was not to be. At an event at Georgia, he announced he was done with football. After struggling with reading, he joined a women’s book club and later became an author of his own children’s book, “The Magician’s Hat”. He created the children’s literacy program, “Read with Malcolm” as well as the “Share the Magic Foundation.” Although his NFL career was painfully short, he is making a lasting impact off the field. And he’ll always have SB LI. With the free agency losses of both Trent Brown and swing tackle LaAdrian Waddle, the tackle position on the Patriots offensive line has gotten much thinner. And with last year’s top draft choice, Isaiah Wynn (23rd overall selection) coming off of an Achilles injury, it makes things even more uncertain. That’s why we expect the Patriots to make a tackle selection early in the upcoming draft. If Wynn is healthy and ready to go for the season, it would put he and veteran Marcus Cannon at the tackle positions. Wynn has yet to play a snap in the NFL and their backups are limited to practice squad player Cole Croston, Dan Skipper, and Ryker Matthews. Even with the legendary Dante Scarnecchia coaching the offensive line, that leaves too much of an unknown factor in the mix. During our first mock draft, we had the Patriots taking Greg Little from Ole Miss as a tackle. He’s one of the best pass blockers in the draft and can play left or right tackle. He could be the swing tackle in 2019 and be prepared to take over for Cannon in the future if all works out well for Wynn. Achilles injuries are different from everyone, Vince Wilfork told Mike Reiss that it took him a full year and a half before he felt right again. Bill Belichick was on hand at the recent Pro Day workouts in Alabama and Georgia getting an up-close look at several of the players who will hear their names called in the upcoming NFL Draft. Belichick, sporting an Alabama sweatshirt, no doubt courtesy of his buddy, Crimson Tide coach Nick Saban seemed to be completely in his element. Dante Scarnecchia, meanwhile, was working much closer to home, attending the workout for the Boston College players, who have several players who should be drafted next month. One player who was drawing interest from Scarnecchia is Eagles interior offensive lineman Chris Lindstrom. Lindstrom is from Dudley and parlayed an outstanding high school career at Shepherd Hill under the coaching tutelage of his father Chris who played in the NFL, into being a four-year starter for the Eagles. 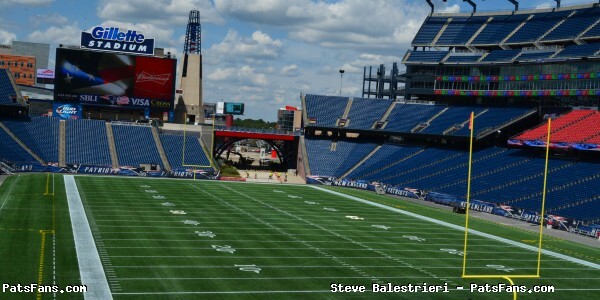 In just a month, the Patriots will begin voluntary workouts at Gillette Stadium. Four of the Patriots, Devin McCourty, his brother Jason, Duron Harmon and Matthew Slater, all members of the advocacy group, the Players Coalition, testified on Friday in support of Sen. Sonia Chang-Diaz’s education bill, the PROMISE Act. The Players Coalition stated goal is to make an impact on social justice and racial equality at the federal, state and local levels through advocacy, awareness, education, and allocation of resources. Chang-Diaz’s bill, one of several, has been backed by teachers, parents, mayors and education advocates. 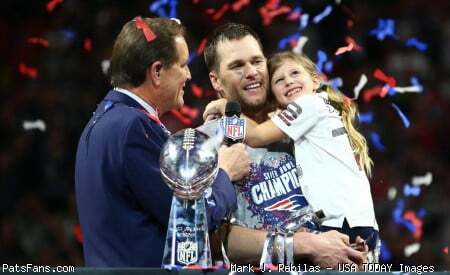 And she got the blessing of four of the Patriots star players. The goal of the bill is to bridge the gap in education spending between richer and poorer communities. “We are prepared to battle for our children,” said Devin McCourty. Patriots tight end Rob Gronkowski still hasn’t decided whether to return for the 2019 NFL or to retire. Mike Giardi of the NFL Network said that several members of his family are worried about the long-term health of the big man, not just from the surgeries to his back, knee, and arm but also the blows to his head. If Gronkowski does indeed retire, it would add nearly $10 million in salary cap space but also leave a tremendous hole at the tight end position. Regardless, the Patriots are expected to add the tight end position in the upcoming NFL draft where several intriguing options exist. They have to start grooming a potential successor even if he does return. Lacosse will bring an immediate upgrade at the backup tight end position in the passing game as he should have little trouble passing Dwayne Allen’s 13 receptions in two years, including only 3 in 2018. However, Allen was one of the better blocking tight ends in the league. Lacosse has a long way to go there. The Buffalo Bills added a trio of players this week, signing guard Jon Feliciano from the Raiders as well as tight end Jake Fisher and linebacker Maurice Alexander as they continue to build the depth of their roster. Feliciano is an intriguing player. Stuck on the depth charter behind center Rodney Hudson and guards Kelechi Osemele and Gabe Jackson in Oakland, he started just eight games in four years but appeared in every one. Known as a very physical player who has a mean streak he’ll immediately vie for starting reps.
Fisher was an offensive tackle who lost some weight and converted to tight end. The former 2nd round draft pick is on a one-year contract. He’ll be used as a blocking tight end or an extra offensive lineman. Alexander came over from the Seahawks where he was a reserve safety and special teams’ contributor. He’ll probably be the “big nickel” linebacker and STs for the Bills. The Miami Dolphins solved the immediate need for a quarterback by signing veteran Ryan Fitzpatrick, making Miami the third AFC East team he’s played for. He’ll be the bridge QB for the time being while the team searches for hopefully their franchise QB. Miami watched Dwayne Haskins and Drew Lock at their respective Pro Days. Another big need is at the edge. Cameron Wake is gone, Robert Quinn is rumored to be gone also very shortly, which leaves Miami with just Charles Harris. So, the Dolphins are bringing in TCU edge rusher L.J. Collier, who is a shorter, more compact player who was considered a late-round prospect. But a good week in Mobile at the Senior Bowl may have changed the Dolphins perspective on him. The New York Jets have struggled to run the ball the past two seasons and have given up an inordinate amount of pressure up the A-gap because of poor play at the center position. Spencer Long had a nightmarish season and was cut loose. Many expected the Jets to target Matt Paradis from Denver or Mitch Morse of the Chiefs in free agency. While the Jets are thought to be looking for a long-term solution during the draft, they are also thought to be looking at Stefan Wisniewski who spent the last three years with the Eagles. He’d be a stop-gap measure but regardless would bring an immediate upgrade in talent at the position. With the Jets looking to make a big step in rebuilding the team with a young QB in Sam Darnold, they can’t have running for his life every week. Follow me on Twitter @SteveB7SFG or email me at [email protected]Listen to our Patriots 4th and 2 podcasts on blog talk radio as Russ Goldman, Derek Havens and myself from PatsFans.com discuss the latest Patriots news and game analysis. 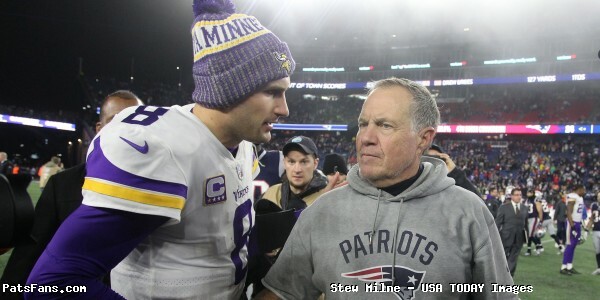 This entry was posted in 2019 Patriots offseason, NFL Commentary, NFL News, Patriots Commentary, Patriots News, Patriots Podcast, Patriots Rumors and tagged 2019 NFL Draft, Bill Belichick, Buffalo Bills, free agency, Isaiah Wynn, LaAdrian Waddle, Marcus Cannon, Miami Dolphins, New England Patriots, New York Jets, Rob Gronkowski, Tom Brady, Trent Brown on March 24, 2019 by Steve Balestrieri. Good morning, here is your Sunday Patriots news 02-10 and AFC East Notes. Patterson With a Diamond-studded Gift for Brady: Patriots WR/KR/RB Cordarrelle Patterson was obviously very grateful for his 2018 season with the Patriots and especially with Tom Brady. Patterson made a gift of a diamond-studded TB12 logo to Brady after the Super Bowl, which no doubt set him back thousands of dollars. Brady posted a picture of his daughter wearing it on his Instagram page. She saw it and fell in love with it…Diamonds are a girl’s best friend. What a Crowd for the Parade: The Patriots 6th Super Bowl win this week featured a couple of huge crowds which put to rest that the fans were getting blase about the team’s continued success. The turnout for the send-off rally was over 35,000 fans and the Super Bowl parade which had a huge crowd of 1,500,000 fans in downtown Boston. The crowd at the game itself was the first time that the Patriots had a clear advantage in terms of crowd noise. It never gets old or taken for granted. Did you Know? For the yards are more important than points crowd… The Patriots in SB LIII garnered more yards (407) than their season average (393) against the Rams. While the defense held the Rams to 160 yards fewer (260) than their season average which was 421. When we wrote about the defense coming together late in the season, many scoffed at it. After those last three playoff wins, nobody is scoffing now. A Return for Amendola? The latest news out of Miami is that the Dolphins are rumored to be moving on from WR Danny Amendola after just one season in South Beach. If that were to happen, could a return to Foxboro be in the cards? Absolutely. And I know a certain QB that would love to see that happen as well. Close the Roof: With another sound clip from just before the game started, watching Bill Belichick questioning the timing of the roof closure after the flyover shows how detailed the Patriots and their coaches are in preparation for every possible scenario. In a game dominated by defense, there are several plays that could fit the bill as favorite plays of the game. The pass breakup by Jason McCourty in the end zone, Stephon Gillmore’s interception, Dont’a Hightower just blowing up Tyler Higbee during the Danny Shelton’s run stuff, but my personal favorite was from Kyle Van Noy. The Rams rolled Jared Goff out to the right and had three WRs flooding the zone. Josh Reynolds was the main target doing a shallow cross about 3-4 yards off the line of scrimmage with a deeper cross about 12 yards and Cooks running a deep corner route. Van Noy was supposed to get sucked into Goff which allows his an easy window to complete the pass and have an easier 7-10 yard pass play. But Van Noy recognized the play coming, and slowed up to hit Reynolds with a forearm, flattening him. He then joined the rush after Goff, who had nowhere to throw and was forced out of bounds. It was a tremendous play. The Miami Dolphins hired former Patriots de facto Defensive Coordinator Brian Flores this week and Flores has brought three Patriots assistant coaches with him to Miami. Former WRs coach Chad O’Shea will become the Dolphins offensive coordinator. Josh Boyer who coached the NE cornerbacks will handle the same duties in Miami with the added title of defensive passing game coordinator as well. And Jerry Schuplinski, the assistant QBs coach will also handle the same duties there. With Flores departure for South Beach, the Patriots are looking for a couple of defensive coaches and what was first reported locally by Jim McBride of the Boston Globe, the Patriots are reportedly close to signing former Tampa Bay head coach Greg Schiano as their next DC. Schiano spent the last two years as the Ohio State DC and is a friend of Bill Belichick’s. But where Schiano is best known for was his time as Rutgers’ head coach. During his tenure there 19 players who played for him made their way to New England. Those players included Devin and Jason McCourty, Duron Harmon, Logan Ryan, and current Patriots safety coach, Steve Belichick. Bill Belichick will always surround himself with players he likes, and the Rutgers connection with Schiano is a testament to that. He and Schiano should get along fine. As tough as it is moving on from Super Bowl LIII, time marches on and now the team will have a lot of tough personnel decisions to make in 2019. Here is the list, and it is lengthy of the Patriots free agents this year. Obviously, the two top free agents are Flowers from the defense and Brown on the offense. Flowers has arguably been the Patriots best defensive player for the past three years and has led the team in sacks in those three. The Patriots will no doubt try to find a way to secure Flowers services but he’s in line for a huge payday and is considered one of the top free agents this spring. Brown was brought on-board last spring and had never played left tackle. He took over the position early in training camp and never looked back. He was very solid in pass protection and was terrific in run blocking, especially in the postseason. He’s another guy inline for a huge payday. Hogan will probably be gone although I do believe that the team will make efforts to bring back both Dorsett and Patterson, the latter who did a bit of everything this past season, playing wide receiver, running back and returning kickoffs. Patterson had a combined yardage total of over 1100 in 2018. Dorsett was a forgotten man during the time Josh Gordon was on the team, but contributed down the stretch and had a big TD reception in the AFC Championship Game. Gostkowski and Allen are an excellent duo. Gostkowski has been here since Adam Vinatieri left in 2006. Allen was outstanding in the Super Bowl, pinning the Rams three times inside their 10-yard line. It will interesting to see if McCourty returns, there were rumors that he and his brother Devin may retire after the Super Bowl but he played well all season and made a huge play in the Super Bowl, coming from across the field to break up a pass for Brandin Cooks in the end zone. Rowe began the year as the #2 corner before landing on IR after just four games. Brown and Shelton are the two big guys in the middle of the DL.Both played well down the stretch and into the playoffs. However, after passing on the fifth-year options on both, the team may only resign one. Waddle has been a valuable swing tackle, with the health along the OL this season, he wasn’t used as much. Simon, McClellan and Humber were brought in mid-season and all filled valuable roles. The team will probably look to retain all three. Jones and Gordon are restricted free agents. And the interesting aspect of Gordon is that he can apply for reinstatement in May of this year. In a really good piece by Vic Carucci, the Buffalo Bills in the first two seasons under Sean McDermott have been trying to manage expectations and build for long-term sustained success. So with about $80 million in cap space this spring, GM Brandon Beane in a letter to season ticket holders is preaching more caution. The message is to not expect the team to go all-in in free agency for instant gratification. “The sole focus is to build the Buffalo Bills into a championship contender and help create a culture aimed at long-term, sustained success,” Beane wrote. That is the correct way to build a winner. The Bills are still a long ways off from being a true contender and now they’ll try to start adding the long-term pieces that they’ll need to surround their young QB Josh Allen. “The previous two draft classes have begun a new foundation of young players on our roster,” Beane wrote. “We are encouraged by the development thus far by players like Josh Allen, Tremaine Edmunds, Tre’Davious White and others. Each of them was given an individual plan of improvement at season’s end and they understand they have a lot of work in front of them. The Miami Dolphins hiring of Brian Flores is a new change of regime, of which the Dolphins have had plenty but this time they are hoping to catch lightning in a bottle with a big New England Patriots presence going to South Beach with Flores, Chad O’Shea, Josh Boyer and Jerry Schuplinski also coming on-board. One of the more surprising bits of news coming out of Miami is that the Dolphins are planning on moving away from WR Danny Amendola, who they brought in a year ago to bring the veteran presence to the Dolphins locker room. That will bear watching. Flores, like Belichick is behind the power curve in terms of being far behind in preparation for the NFL Combine, but the Dolphins will be looking to find their next franchise QB and are in need of a true nose tackle either in free agency and the draft. The New York Jets hired Adam Gase as the new head coach for Gang Green. And as Rich Cimini of ESPN has pointed out, there is certainly no lack for potential controversy there. The full staff, announced Friday by the Jets, includes longtime NFL assistant Joe Vitt, Gase’s father-in-law, and Blake Williams, the son of defensive coordinator Gregg Williams. Vitt and Gregg Williams were members of the New Orleans Saints’ coaching staff implicated in the 2012 BountyGate scandal. In the bounty hearings, conducted by former NFL commissioner Paul Tagliabue, Vitt accused Williams of lying in his testimony. Blake Williams, 34, has a reputation for rubbing people the wrong way. As a St. Louis Rams assistant, he upset people in the organization by screaming at a draft prospect in a scouting-combine interview, a source said. He also was reprimanded multiple times for sitting in the wrong seat on the team bus; he kept sitting in a seat reserved for a senior member of the staff. The Rams fired him after the 2013 season. Williams has only worked for NFL teams in which his father was on the staff. Gase also hired Jim Bob Cooter as the Jets running backs coach. With an eclectic group like this with all of the potential fireworks with the coaching staff, I believe that this will be a perfect choice for Hard Knocks this summer. 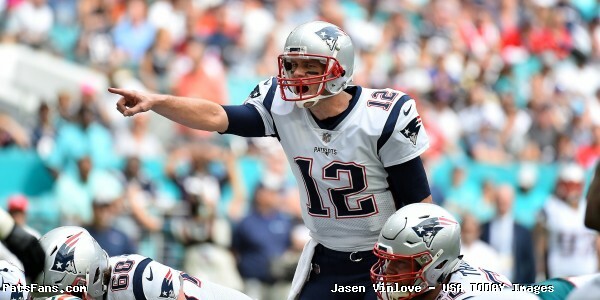 This entry was posted in 2019 Patriots Offseason, NFL Commentary, NFL News, Patriots Commentary, Patriots Podcast, Patriots Rumors, Patriots Twitter, Super Bowl LIII and tagged Adam Gase, Bill Belichick, Brian Flores, Buffalo Bills, Chris Hogan, Dont'a Hightower, josh gordon, Kyle Van Noy, Miami Dolphins, New England Patriots, New York Jets, Phillip Dorsett, Sean McDermott, Tom Brady, Trent Brown, Trey Flowers on February 10, 2019 by Steve Balestrieri. Although many Patriots fans are still trying to process just what went wrong during the teams stunning 34-33 “Miracle In Miami” loss Sunday, the quarterback has already moved onto the Pittsburgh Steelers. quarterback Tom Brady doesn’t believe Sunday’s last-second defeat will effect the team the remainder of the season. This entry was posted in 2018 Patriots Regular Season, Patriots Podcast and tagged Julian Edelman, Tom Brady on December 11, 2018 by Robert Alvarez. In this episode of Patriots Fourth And Two, we started the show by discussing if we believe in the Patriots defense now. Later on, we previewed the upcoming game for the Patriots against the Dolphins. You can now get the show on the YouTube Channel for Patsfans.com! This entry was posted in Patriots Podcast and tagged Bill Belichick, Dont'a Hightower, Julian Edelman, Miami Dolphins, New England Patriots, Rob Gronkowski, Tom Brady, Trey Flowers on December 6, 2018 by Russ Goldman. In this episode of Patriots Fourth And Two, the guys look back at the Patriots victory against the Vikings. This entry was posted in Patriots Podcast and tagged Bill Belichick, Julian Edelman, Minnesota Vikings, New England Patriots, Patriots, Rob Gronkowski, Rob Ninkovich, Trey Flowers on December 4, 2018 by Russ Goldman. Patriots Fourth And Two Podcast: We Are On To Minnesota! In this episode of Patriots Fourth And Two, we began by looking back at the victory for the Patriots against the Jets. We reviewed the play of the offense and defense, along with discussing what was the turning point in the game. We also talked about the play of Sony Michel for the Patriots. 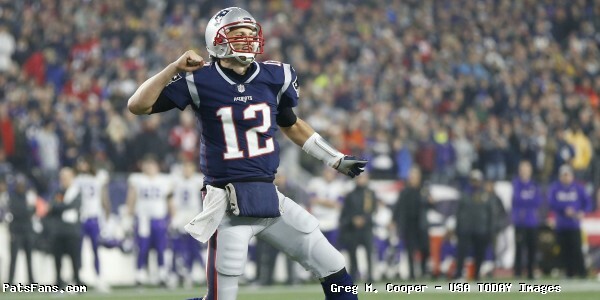 Later on, we previewed the huge game on Sunday for the Patriots against the Vikings. We shared who we give the advantage to in several match-ups, along with giving our keys to victory. The show ended with our predictions for this game. This entry was posted in Patriots Podcast and tagged Bill Belichick, Julian Edelman, Minnesota Vikings, New England Patriots, New York Jets, Rob Gronkowski, Sony Michel, Tom Brady, Trey Flowers on November 29, 2018 by Russ Goldman. In this episode, we first played a game called “NAME THAT TEAM” as the co-hosts tried to guess which NFL Team was described by their NFL Rankings in several offensive and defensive categories. Later on in the episode, we previewed the upcoming game for the Patriots against the Jets. This entry was posted in Patriots Podcast, Uncategorized and tagged Bill Belichick, New England Patriots, New York Jets, Tom Brady, Trey Flowers on November 21, 2018 by Russ Goldman. Good morning, and here is your Sunday Patriots news 11-18, & AFC East Notes. Not a SB Team? 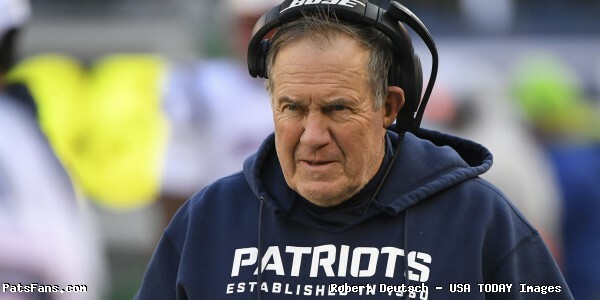 Former Patriot front office assistant to Bill Belichick, Mike Lombardi stated he has serious doubts that this Patriot team has what it takes to make it to the Super Bowl this year. On a podcast, he was direct in his belief. “To me, this is not a good Patriots team. I have been saying it all year,” Lombardi said. Did you Know? That yesterday November 17 was the 50th anniversary of the famous “Heidi” game. In 1968, the Jets and Raiders were locked in an epic shootout and the network cut away from the game to broadcast the film “Heidi” in their 4 p.m. time slot. The Raiders scored twice in the last minute to win 43-32, but the only people in America that got to see that were the fans in the stadium. Did you Know Pt.2? With 147 yards passing next week against the Jets, Tom Brady will become the NFL leader in passing yardage, regular and post-season combined. Did you Know Pt. 3: Since 2003, the Patriots are 46-7 (.868 win percentage) following a loss. That doesn’t bode extremely well for a Jets upset next week in the Meadowlands, but that is why they play the games. Did you Know Pt. 4: Things that make you go hmm. There was a stat on social media, the other day, and I truly can’t remember who posted it to give proper credit, but here is a good one, especially for the “Belichick can’t draft” crowd. Now factor in WHERE the Patriots draft in relation to those other teams as well as everyone else, and presto!, their ratio isn’t so bad now, is it? James White set a new personal best with 66 catches and is only 11 away from a new Patriots record. Tony Collins set the team record with 77 catches in 1986. White is also right on pace with some of the best #s of catches by a running back after 10 games. Kaepernick to the Patriots Rumors: The Patriots were rumored in September to be in talks with QB Colin Kaepernick to bring him to New England to back up Tom Brady. At the time, Patriots owner Robert Kraft, kind of dismissed that idea, not really confirming or denying it was true. However, in an interview with Devin Gordon of the NY Times, Kraft had this interesting tidbit about Kaepernick. “Let me say this: I would very much like to see him in the league,” Kraft said. That should stoke the Kaepernick to NE rumors again. Heating Up in the Colder (Snowy?) Weather: Since 2001, the Patriots are 101-29 with a winning percentage of .784 on or after Thanksgiving. That is the best in the NFL. Under Bill Belichick, Patriots teams always seem to get better as the season rolls along. Let’s see how this starts out in 2018 next week against the Jets. Last week we wrote that the Patriots lost a golden opportunity to keep pace with the Chiefs who are 9-1 and now two games ahead of the Patriots in the AFC. The loss dropped New England out of the top two as Pittsburgh only has two losses (6-2-1). But the Patriots are far from out of the running for a bye once the playoffs roll around. Why? Take a look at the schedules of the teams involved. The Chiefs (9-1) have an upcoming game this week against the Rams, and also have games upcoming against the Chargers, the Seahawks (in Seattle) and a possible trap game against the Ravens who have a tough defense. The LA Chargers (7-2), I still have a hard time NOT saying San Diego, have games coming up against the Steelers, Chiefs and possible trap games against the Ravens and Bengals. The Steelers (6-2-1) have the Chargers and then the Patriots and Saints in back-to-back games and also play the Jaguars today, the team who beat them twice in Pittsburgh last season. Everybody can’t win out, they all play each other. And think about this, the Chargers are only a game behind the Chiefs in the loss column, that division is far from locked up. So, the Patriots are in a position where, if they play well down the stretch, should be in a great position to lock up a first-round bye for the playoffs. The games will get very intriguing from here on out. With the Patriots off this week, they always do their own self-scouting and look to where the team feels it needs improving to finish the season strong. We’re going to post our own analysis on where we feel the team needs to improve to get a bye in the first round of the playoffs and possibly parlay that into another game for NE in February. Improve Special Teams- Specifically the coverage units. Very uncharacteristically for a Bill Belichick team, the Patriots have been bad in kick coverage this year. They currently rank 29th and 31st correspondingly in Punt and Kick coverage. That is not good, especially with a defense that has had its struggles this year. The team seems to have already addressed those issues. They brought in STs/LBs Albert McClellan, formerly of the Ravens last week and just signed Ramon Humber who has spent time with the team in the past. The return units are actually rounding into form quite well. The Patriots rank 2nd in the league in kickoff return yardage and 2nd in punt return average. Get a Healthy Gronk and Burkhead Back for the Offense- The Patriots offense, while scoring at the 8th best mark in the league, can actually be much, much better. They’ve been very inconsistent and need to get their key skill position players healthy as well as their offensive line for a late-season push. Gronkowski has missed several games and has been hobbled for much of the season beyond that. Besides being the best overall tight end in the game when he’s healthy, he provides matchup nightmares for defensive coordinators. If opponents double him, they leave someone else open. He’s a devastating blocker in the running game as well. Jacob Hollister has also been hurt most of the year, so it has left the tight end position with very little production. Dwayne Allen has two catches on the year. Burkhead is a very valuable piece as he can spell both Sony Michel in the running game and James White in the passing game. While he’s the equal of neither in their respective strengths, his versatility makes him keep opposing defenses honest. Getting both Gronkowski and Burkhead back and healthy for a stretch run will do wonders for the Patriots offense. Where’s The Beef (Pass Rush)- Thru the first 10 games the Patriots have just 15 sacks. That is 30th in the NFL and isn’t going to get it done. While they have gotten decent enough pressure on opposing QBs, the pass rush has to get home with much more regularity. It is a big difference between an incomplete pass on 2nd and 4 because of pressure and facing a 3rd and 12 or 13. Trey Flowers has been outstanding and does so many things well, but the other players need to step up their games more. Although even Flowers would be best served with a bit more production as well. They’ve been creating some extra pressure by using corner and linebacker blitzes. But as we’ve seen before, the best teams will pick up on those and it can be a dangerous situation if they do. 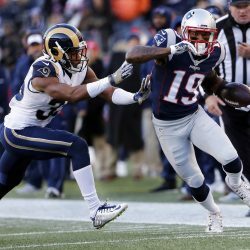 Brady Needs to Spread the Wealth Around- One of the things that has reared its ugly head last week in the loss to the Titans was the fact that Brady was locking into his primary receivers (Josh Gordon, Julian Edelman, James White) and has pretty much ignored his secondary WRs (Chris Hogan, Phillip Dorsett). That’s always been a sure sign that Brady is struggling and that needs to change. Brady had Hogan wide open with what appeared to be a touchdown last week, instead, forcing the ball to Edelman on 4th down. This plays into what we mentioned above and getting everyone back and healthy but he needs to do a bit better job overall and certainly to use all of his weapons. He said as much this week. Our buddy Mike Dussault from Pats Propaganda wrote a very intriguing piece the other day where he said there is a very real number of national football writers and NFL fans that can’t wait for the demise of Tom Brady. Mike hit it right on the head and I would encourage everyone here to check it out. And it is true. But 2003 happened and the kid showed it wasn’t a flash in the pan and he led another final Super Bowl drive to give his team another win and the hot take crowd wasn’t happy. By 2004, the great story had turned to an open hatred of him, his unquotable coach and the team that won 3 out of 4 Super Bowls. After leaving Manning in the dust with eight Super Bowl appearances and five wins, now the cretin, ultracrepidarians can’t wait for him to fail. Which is why after every Patriot loss, they rush to the microphone to spew their latest drivel about the “cliff’ or whatever else they do. Don’t bother. One of those loudly proclaimed after the 2011 Super Bowl loss to the Giants that “Tom Brady will never see another Super Bowl” Three SBs and two wins later, now this buffoon rushes to the microphone to say…”All of those don’t really count”. Okay. The two real questions are #1. Who would hire someone who is more wrong than the worst weatherman in the U.S.? And #2, Are your lives so pathetic, the hate for all things NE so bad, that you rush to listen to this after every NE loss? I wonder how bad the cheering will be against Brady this February when NE and NO have the Super Bowl QB AARP game of the ages? Don’t bet against it. I called it before Week 1 and I’m sticking to it until proven otherwise. Fast forward to the 37:15 mark and there it is. No AFC East Notes this week as everyone is on the bye week. We’ll have those back next week. Listen to our Patriots 4th and 2 podcasts on blog talk radio as Russ Goldman, Derek Havens and myself from PatsFans.com discuss the latest Patriots news. 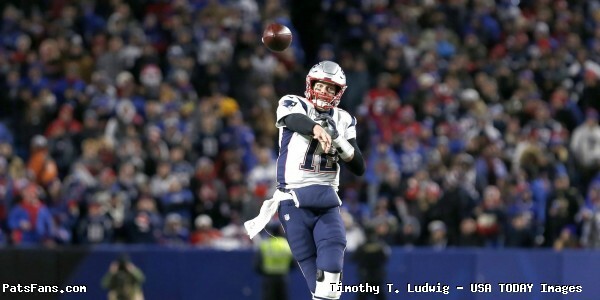 This entry was posted in 2018 Patriots Regular Season, NFL Commentary, NFL News, Patriots Commentary, Patriots Film Room, Patriots News, Patriots Podcast, Patriots Rumors and tagged 2018 Patriots season, Bill Belichick, Buffalo Bills, Chris Hogan, James White, Julian Edelman, Kansas City Chiefs, Los Angeles Chargers, Miami Dolphins, New England Patriots, New York Jets, NFL, Patriots, Patriots edge rushers, Pittsburgh Steelers, Rob Gronkowski, Tom Brady, Trey Flowers on November 18, 2018 by Steve Balestrieri. Although their time as teammates in New England didn’t end the way they had hoped for, Patriots wide receiver Julian Edelman still has plenty of love and appreciation for Malcolm Butler. On Tuesday, Edelman shared photographs of the two together over Instagram. The first photograph was an embrace on the field after Sunday’s game and the second was from their 2015 Grammy Awards appearance. 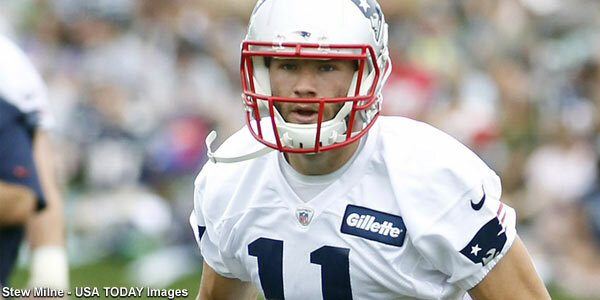 “Nothin but respect for my brother” Edelman wrote in an accompanying caption. This entry was posted in 2018 Patriots Regular Season, Patriots Commentary, Patriots Podcast, Patriots Twitter and tagged Julian Edelman, Malcolm Butler on November 14, 2018 by Robert Alvarez.